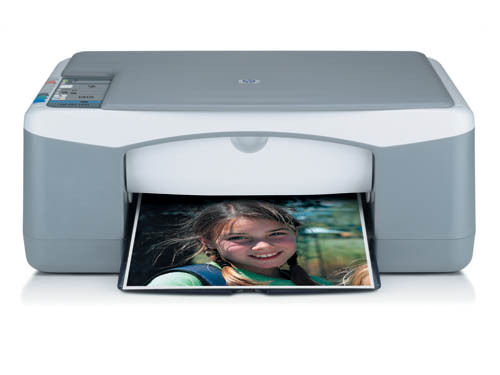 The HP PSC 1417 is an all-in-one printer with copying and scanning features. It can copy without a PC, making it a great addition to a home office / small office. The HP PSC 1417 has a monthly duty cycle of 5000 impressions; the input capacity is 100 sheets while the output capacity is 50 sheets. The HP PSC 1417 is cheap but may seem outdated, though. It may not work with newer operating systems. The printer uses drop-on-demand inkjet technology. The flatbed scanner is on top of the printer, along with the control panel. The maximum print resolution is 4800 x 1200. More importantly, the HP PSC 1417 is capable of printing on different types of media such as cards, envelopes, transparency films, and labels. You can make copies even without a computer, as the HP PSC 1417 is a stand-alone machine featuring with a small LCD display to show copying features. The initial cost of HP PSC 1417 is low, but it delivers high-quality prints. You can expect vivid photos and crisp documents. This printer is not ideal for workgroups, as it is not network-ready and it does not have Wi-Fi. Connectivity options include USB; the USB cable is bought separately. The HP PSC 1417 lacks several features like an LCD display, automatic document feeder, and a fax. The print speed is rather slow, but is ample for most low-volume tasks.